Services on the Elizabeth Line, Crossrail’s new railway for London and the South East, start between 2018 and 2020. Much has been written about its network of new tunnels under London, yet a major proportion of the construction work has involved reusing disused rail infrastructure and so has presented engineers with new challenges. This has called for fast and flexible software tools. This remarkable project has demonstrated the benefits of software tools that allow for analyses to be adapted for temporary conditions quickly and easily, which is one of the core benefits of Oasys GSA. Typical of these refurbishments is the Connaught Tunnel on the former North London Line branch to North Woolwich, originally built in 1878 and closed to passenger traffic in December 2006. Work to breathe new life into the 550m tunnel, which runs below the Royal Docks passage, has now been completed. It has involved the total replacement of twin, brick-lined single-track tunnels with a single, twin-track concrete box accommodating trains and overhead line equipment (OLE) that has been built partly in situ and partly in cofferdam. The new concrete box was designed to accommodate lateral soil pressure and a roof surcharge. It accommodates the dead weight of the track and superimposed live loads from trains, as well as uplift from ground water. It has also been checked for the effects or predicted changes in groundwater. That said, the analysis for its permanent condition was relatively straightforward, according to the Arup-Atkins engineers who led the design team. It was based on previous geotechnical ground investigations. 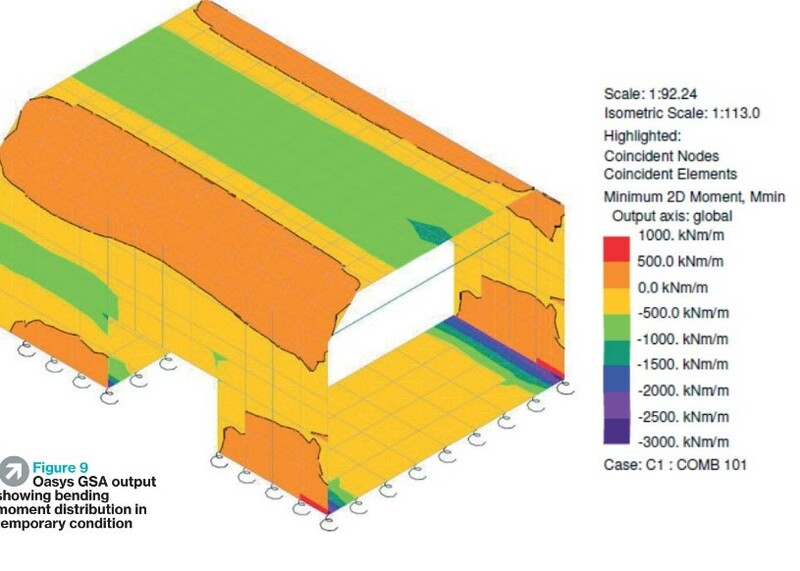 The structure was modelled using Oasys GSA 2D quad elements, typically 1m x 1m to predict displacement. A major consideration was the possibility of loss of water from the docks: given a combination of failure of the gates and a very low tide, the weight of remaining water would not provide sufficient dead weight. So existing Victorian brickwork was brought into the model as an integral design component to resist predicted uplift. Conversely, the design also allows for the extra weight that would be imposed should a vessel sink in the passage above. It was the construction phases of the project presented more taxing problems. First the side walls were cast to fit the existing brickwork and cast steel profile. Next came the roof section, followed by the invert (floor) and then the lower side walls. Particular attention was paid to the length and sequence of the invert bays or sections, including the ability of the new structure to span the temporary voids that would be created by the excavation of the original Victorian invert brickwork. 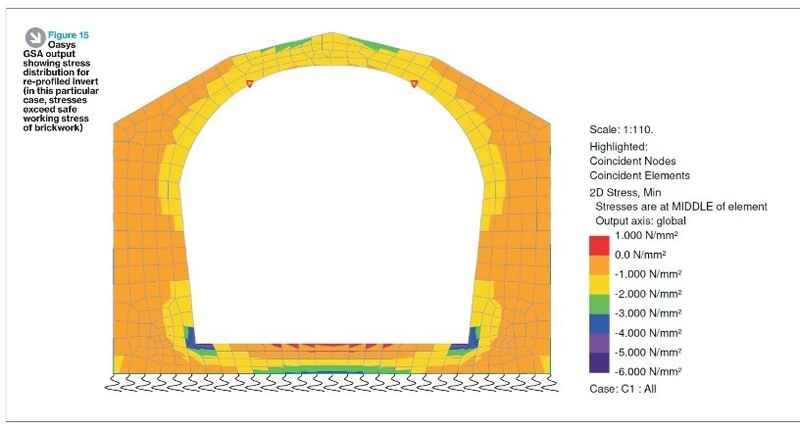 Oasys GSA output showing stress distribution for re-profiled invert (in this case, stresses exceed safe working stress of brickwork. As a result, the invert replacement called for flexibility and fast reiteration of the 3D finite element model that had been created in Oasys GSA. The engineers were able to determine the impact of variations in the actual lengths of original invert bays as they were excavated and, as a result, lengths were increased from the original assumption of 4.0m to 4.3m, with two central 5.0m bays. This meant that fewer bays were required and generated savings in time and cost. A full report of the rehabilitation of the Connaught Tunnel can be read in The Structural Engineer, August 2016.